An artist's impression of the Fraser Residence Kuala Lumpur. GEORGETOWN: YNH Property Bhd aims to tap companies on the Fortune 500 and Forbes lists for its RM550mil Fraser Residence Kuala Lumpur mixed-development project to be managed by world-renowned hospitality service provider, Fraser Hospitality Pte Ltd.
Group executive chairman Datuk Dr Yu Kuan Chon told StarBiz the group was launching the project because it believed there was room for a premier international serviced residence brand in Malaysia. “We engaged Fraser Hospitality as management service provider because more than 80% of its guests are on Fortune 500 and Forbes’ lists,” he said, adding that the agreement to engage Fraser Hospitality was inked on Wednesday. The 446-unit Fraser Residence will be constructed next to Renaissance Hotel, facing both Jalan Ampang and Jalan Sultan Ismail. The project comprises two towers with one-and-two-bedroom serviced apartments. There will also be office suites, a retail mall, a sky gymanasium, infinity lap pool and whirl pool sauna. Construction work is expect to start this year and scheduled for completion in four years. YNH has also engaged Fraser Hospitality to manage Fraser Place Kuala Lumpur, which is scheduled for completion in the third quarter of 2009. “This project offers gold-standard serviced residences comprising studios, one-and-two-bedroom units and luxurious penthouses,” Yu said. On a separate matter, Yu said YNH had on Feb 19 entered into a memorandum of understanding with Pantai Holdings Bhd to jointly build, lease and operate a private hospital in the Manjung Point township development in Sri Manjung, Perak. “A Pantai hospital will add value and provide first-class medical facilities and services in our existing and future developments in the Manjung Point township. Pantai, with its experience and expertise, sees Sri Manjung as a very attractive investment,” he added. The Oakwood serviced apartments in Danga Bay, a RM650 million project under Iskandar Malaysia in Johor, is expected to kick off next month and be completed in 2012. The project will be developed by Global Corporate Development Sdn Bhd, a joint venture between Iskandar Waterfront Development Sdn Bhd (IWD) and Danga Bay Sdn Bhd (DBSB). The serviced apartments will be managed by Oakwood Asia Pacific (OAP) Pte Ltd. The project, with 230 fully-furnished luxury units, is the crown jewel flanked by two 38-storey towers of residential units, called Iskandar Residences. The latter comprises 523 units on 2.5ha. While the Oakwood apartments are for lease to locals and expatriates seeking mid- to long-term accommodation, the Iskandar Residences units are up for sale from RM450 per sq ft for early birds. Johor Menteri Besar Datuk Abdul Ghani Othman, who is the Iskandar Regional Development Authority co-chairman with Prime Minister Datuk Seri Abdullah Ahmad Badawi, witnessed the signing of the joint-venture agreement between IWD and DBSB in Danga Bay yesterday. IWD was represented by its chairwoman Arlida Ariff, and DBSB by its director Johar Salim Yahaya. The management agreement appointing OAP as the operator of the Oakwood serviced apartments was signed between Arlida and OAP managing director P.G. Matthew. Ghani, who is spearheading the rollout of the Iskandar Malaysia development blueprint, said the launch marked the first among a host of signature waterfront developments in Danga Bay, ranging from affordable to high-end homes such as the Danga Villa Island project. Other highlights include hotels, no-frills to six-star, and a water theme park. JOHOR BARU: Danga Bay is set to transform itself into one of the most sought after waterfront development addresses in the world in the near future, with several up-scale waterfront property development projects to be launched soon, said Johor Mentri Besar Datuk Abdul Ghani Othman. The upcoming projects are three hotels, including a six-star hotel, a marina, an international convention and exhibition centre, office towers and another wet-and-dry theme park. “These projects reflect a strong confidence on the growth prospect in Iskandar Malaysia despite the global economic slowdown,” he told reporters yesterday, referring to Danga Bay’s location in the special economic zone of Iskandar Malaysia. “The Danga Bay waterfront project site has an excellent road and highway connectivity to major destinations,” he said, adding that the bay area would also benefit from water taxi and ferry services to Nusajaya, the Johor State New Administrative Centre, Singapore and nearby Indonesian islands. Ghani said investor confidence in the economic growth corridor remained strong and that the stakeholders were fully committed to deliver all planned projects under Iskandar Malaysia. Iskandar Malaysia, launched on Nov 4, 2006 was the first in a series of economic growth corridors; as at today, it had received RM43bil worth of investments, from the RM47bil targeted by 2010. 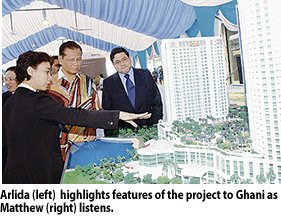 Ghani was speaking at the launch of a RM650mil integrated mixed development project at Danga Bay, near here, by Global Corporate Development Sdn Bhd. The project is a joint-venture project between Iskandar Waterfront Developments Sdn Bhd (IWD), a company majority-owned by Iskandar Investment Bhd (IIB) and Danga Bay Sdn Bhd. Khazanah Nasional Bhd is the largest shareholder in IIB with a 60% stake while the Employees Provident Fund and the Johor government-linked entity Kumpulan Prasarana Rakyat Johor Bhd, hold 20% stake each. Meanwhile, IWD chairman Arlida Ariff said work on the Oakwood serviced apartments and other residential units at Danga Bay would start next month and was expected to be completed in 2012. Located on a 2.5ha site, the Oakwood project is made up of three towers - the 28-storey Oakwood Residence tower and two 38-storey towers known as Iskandar Residences. The Oakwood Residence has 230 fully furnished serviced apartments which will be leased out and managed by Oakwood Asia Pacific Pte Ltd while the other two towers will have 523 apartments for sale. A survey by thinkproperty.my shows Malaysia's negative property outlook has deteriorated further, now at 51 per cent, the lowest since the survey began in May 2008. "Clearly we saw a sharp drop in the index in February. "With unemployment rising and Malaysia's trading partners suffering from the economic slowdown, we believe the index will possibly fall further before it rises again," said Think Media Sdn Bhd chief executive officer Asim Qureshi. The survey also showed the popularity of fixed deposits has fallen to a 10-month low at 27 per cent. "Most investors will look for alternative investment opportunities to fixed deposits given that fixed deposits yield around two to 2.5 per cent," he said in a statement. [The survey, however, showed there has been a continued shift in preference to landed property. Thirty per cent of the respondents favoured link houses in February while the retail and office sectors were less favoured with eight per cent compared to 21per cent in June 2008. Some 1,500 participants responded to the survey which provided the current status of the property market and revealed some interesting trends. Thinkproperty.my is a property related content website owned by Think MediaSdn Bhd. Property developer Island & Peninsular Sdn Bhd (I&P) expects revenue this fiscal year to decline as much as 36 per cent to RM500 million as it plans fewer launches. I&P, a wholly-owned unit of Permodalan Nasional Bhd, posted revenue of RM780 million in its fiscal year ended December 31 2008. Group managing director Datuk Jamaludin Osman said that I&P will continue to offer homes that are "packaged tastefully" and within the price range sought by buyers in choice locations. "We will be more cautious during the current economic downturn, releasing a smaller number of units at all our projects at any given time,"he told Business Times after signing a pact with Universiti Teknologi Mara (UiTM) to incorporate artistic features at its Alam Impian development in Shah Alam, Selangor, yesterday. I&P has a landbank of 5,263ha, with eight ongoing township projects in Selangor and Kuala Lumpur that are worth a few billion ringgit. The developments are Alam Impian, Bandar Kinrara in Puchong, Alam Sari in Bangi, Alam Damai in Cheras, Bayuemas in Klang, Alam Sutera in Bukit Jalil, Seri Beringin in Bukit Damansara, and Taman Setiawangsa in Kuala Lumpur. Jamaludin added, however, that all was not doom and gloom as I&P houses continued to sell even with the weak market sentiments. He cited its Bandar Kinrara development: 60 per cent of the 160 two-storey link-houses costing more than RM400,000 each and 100 per cent of the 22 semi-detached homes of over RM1.2 million each have been sold since their launch in December last year. Jamaludin also said that I&P had no plans to acquire more land as its landbank was sufficient to keep it busy for the next few years. However, he did not rule out acquiring land in the Klang Valley that could be developed immediately. ISLAND & Peninsular Sdn Bhd (I&P) will launch new houses this year, albeit at a more moderate pace, as recession looms. Group managing director Datuk Jamaludin Osman said that I&P was well aware that the property market had softened and would introduce more affordable homes pegged at below RM400,000 each. I&P will launch the houses at its Alam Sari project in Bangi, flagship Bandar Kinrara development in Puchong, and Alam Impian township in Shah Alam, Selangor, he said. "If the market feels that products in this price range will move faster, we will call to it. If people are willing to invest their money in houses, we will launch more units then," he added. According to Jamaludin, I&P has a few launches on the drawing board but is studying the economic situation before moving ahead with its plans. "Some say we are in recession, but people are buying our properties in Alam Impian and Bandar Kinrara. The market is no doubt slow, but it is still a good time to buy. Prices will escalate when the economy recovers," he said. Jamaludin was speaking to reporters in Kuala Lumpur after signing a pact yesterday with Universiti Teknologi Mara (UiTM) to bring the concept of "Township of the Arts" to life at Alam Impian. I&P, a wholly-owned unit of Permodalan Nasional Bhd, has eight projects in hand in Selangor and Kuala Lumpur that are worth a few billion ringgit. Its more exciting project is Alam Impian, launched in December 2006. 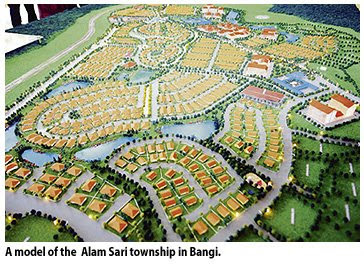 The 494ha RM4.5 billion township will offer 10,000 homes for a population of 50,000 upon completion in 2024. To boost sales, I&P is considering developing a hypermarket and commercial lots after building 600 homes, Jamaludin said. It has launched 308 houses, of which 257 have been built and sold. By May, it will launch Canting 2 featuring 103 super link-homes that cost below RM400,000 each. It may launch more, and bigger, super link-homes by the year-end, priced at RM400,000 to RM500,000 each. Next year, I&P intends to launch semi-detached houses and shoplots, subject to approval and demand. Central to Alam Impian's concept of "Township of the Arts" is the assimilation and application of arts and cultural characteristics in all aspects of the development. Jamaludin said that I&P was considering building an art gallery, theatre and pavilion in the near future. KUALA LUMPUR: Atis Corp Bhd has acquired 15 million RM1 shares in property developer Mutiara Goodyear Development Bhd for RM15mil. economic condition and softer demand due to weak sentiment,” it said. Atis said the investment would not have any effect on the issued and paid-up share capital and shareholdings of its substantial shareholders. NEW YORK: A stunning 48 per cent of America's homeowners who have a subprime, adjustable-rate mortgage are behind on their payments or in foreclosure, and that's not the worst of it, new data yesterday showed. The reckless lending practices in states like Florida, California and Nevada that were the epicentre of the housing crisis are no longer driving up the nation's delinquency rate. Instead, the foreclosure crisis now is being fuelled by a spike in defaults in states like Louisiana, New York, Georgia and Texas, where the economies are rapidly deteriorating and thousands are losing their jobs. A record 5.4 million American homeowners with a mortgage of any kind, or nearly 12 per cent, were at least one month late or in foreclosure at the end of last year, the Mortgage Bankers Association reported. That's up from 10 per cent at the end of the third quarter, and up from 8 per cent at the end of 2007. Duress is no longer isolated to borrowers with lower credit quality. As joblessness grew, so did late payments on prime fixed-rate loans that represent two-thirds of mortgages. "We're seeing increases in fixed-rate categories and that's where the problems are coming from," said Jay Brinkmann, the association's chief economist. "The foreclosure picture is more clearly driven by the jobs market." That trend highlights one of the biggest challenges confronting the Obama administration's mortgage relief plan launched this week. While the US$75 billion plan could help change the loan terms or refinance up to 9 million homeowners, unemployed borrowers will have a hard time qualifying. Yesterday, the Labour Department said new unemployment claims last week totalled 639,000, lower than expected, but still at elevated levels. Few economists expect a turnaround in the battered labour market anytime soon with companies laying off thousands of workers weekly. The tally of initial requests for unemployment benefits fell to 639,000 from the previous week's figure of 670,000, the department said. Analysts expected a smaller drop to 650,000.